This list of free St. Patrick's Day clip art is going to help you create an awesome St. Patrick's Day project this year. Whether you're working on a newsletter, card, or other online or printed project, you're going to love these fun and festive images. 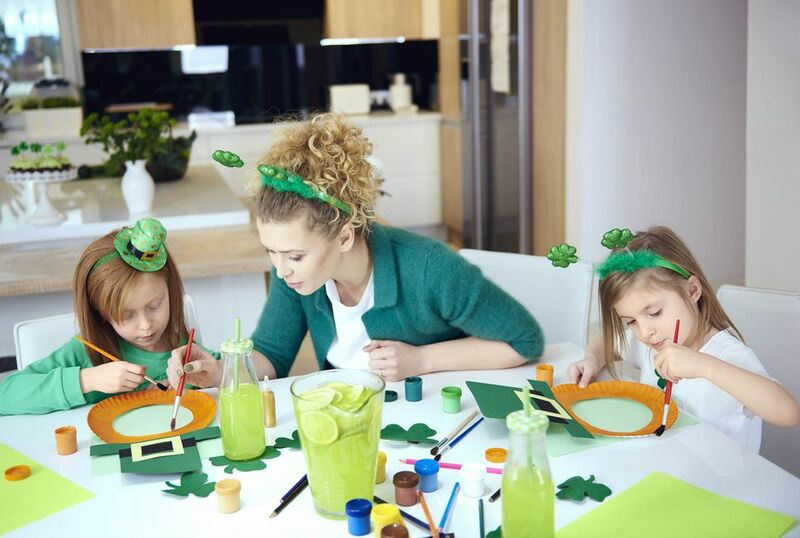 You'll find free St. Patrick's Day images of leprechauns, shamrocks, rainbows, pots of gold, and much more St. Patrick's Day fun. Didn't find what you were looking for? Get creative and check out the illustrations on greeting cards and printable decorations. Ireland First has a group of free St. Patrick's Day clip art that's easy to browse and download. Just scroll down and after you find the free St. Patrick's Day clip art image you'd like to download, click on it to see it enlarged. There are 3 pages of free St. Patrick's Day clip art here at Webweaver's Free ClipArt meaning you should be able to find pretty much everything you're looking for. There's also some animated St. Patrick's Day clip art available if that's what you're looking for. There are some nice large St. Patrick's Day clip art images of leprechauns, pots of gold, harps, fairies, Celtic knots, and Ireland flags here. Click on the image you'd like to download to get a larger image fit for using. There are 3 pages of free St. Patrick's Day clip art at this website and you'll need to use the navigation pages at the bottom to browse through them all. There are a lot of images of leprechauns here but you'll find a few other St. Patrick's Day clip art images included as well. Choose from free St. Patrick's Day clip art in categories like shamrocks, backgrounds, borders, lines, and signs to view that type of clip art. Then you'll need to browse through the pages to view all the free St. Patrick's Day clip art in each category. Classroom Clipart has five pages full of fun St. Patrick's Day images and graphics that are completely free for you to download and use in all your Spring projects. There are images of hats, shamrocks, Leprechauns, pots of gold, beer, harps, saints, rainbows, and children celebrating. You can download any of these images by clicking on the thumbnail to bring up the full-sized image and then used the "Download Image" button. You'll find a page full of free St. Patrick's Day clip art here that you can use for any of your personal projects. There are titles, shamrocks, borders, hats, rainbows, and more. Choose from graphics or animated GIFS in this collection of free St. Patrick's Day clip art. There are leprechauns, shamrocks, and miscellaneous St. Patrick's Day clip art images here free for you to use. With almost 150 free St. Patrick's Day clip art images, myFreeClipart's a great place to go. Use the navigational arrows to browse through all the St. Patrick's Day clip art until you find the one you want.